Runners are finding more ways how to enhance their performance. 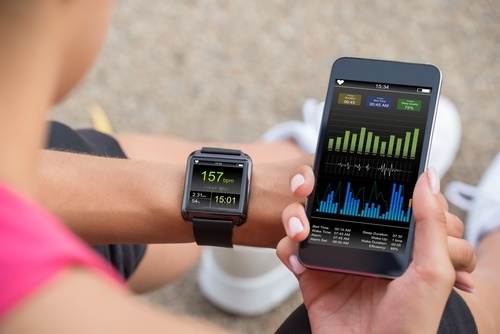 They always want to be informed about what the best and latest gear are, and how they can get a hold of them to improve their performance or make their exercises. As a result of this, there was a greater demand for a wide variety of running gear, one of which are running belts. Whether you are an amateur runner or a professional, there may be times when you feel unsure about whether or not a running belt is a gear that you should consider purchasing. To let you learn more about it, take a look at the 10 benefits of running belt we have listed below. Pocket Space – Running shorts can have lack of available pocket spaces. There are some that do not have pockets or has pockets but are very small. Although aesthetic aspects and the concept of lightweight running is important, there will always come a time when you will need to carry more than your pocket can hold, especially when you run a marathon. This is when running belt becomes a perfect solution. Comfort – Holding things for an extended period of time can be annoying and uncomfortable. Although you can carry something in your hands with the thought that you will only go for a short run, there is a very high chance that you will get tired carrying it and it will be uncomfortable. Aside from this, when you are carrying items in your hands, you are also placing yourself at risk of getting hand cramps or muscle fatigue because of holding a clenching position for an extended period time. A running belt solves these problems for you. Perfect Fit To Suit Your Needs – There are a lot of choices that you can find in the market that offer different features. The best thing for you to do before purchasing a gear is to do your own research first. Talk to someone who is more knowledgeable about running gears, watch videos and read some reviews online. This will let you learn more about what kind of running belt you looking for and what will best suit your needs. They Are Lifesavers – When preparing for an endurance event, you are expected to run for hours every week. If you run solo or enjoy running in the treks of the forest, it is best to bring an emergency kit with you just in case something happened. This is when a running belt would do a great job in holding the things that you need while you run alone or in the woods. Hopefully, you will not need any of the items in your belt, but it will bring great peace of mind to have that option. 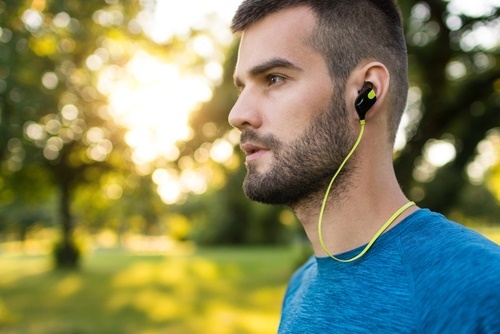 Helps Build Mental Strength – When you reduce distractions from your running routine, you are keeping your focus. The focus is a mental condition you need as you run and when doing endurance training. A reason why running takes all the load off your hands and pants, ultimately helping you focus more. It Will Keep You Hydrated – Your body may tend to work slower than normal when you did not drink enough water. This is a reason why it is very important to keep yourself hydrated because you tend to lose more water as you sweat. To make it easier for you to carry water as you run, the running belt will do the job for you. It Aids In Your Routine – You can start by going to or from work with a sizable running belt or a small runners backpack. This item will allow you to carry the things you need for work and carry them comfortable as you run. You can seamlessly change into your daily outfit, exercise, and carry all your belongings sweat free. Useful In Everyday Life – You will be surprised to learn that you can also use your running belt on other circumstances. Running belts can also be used in keeping you organized as you travel or even just doing your errands. They Are Inexpensive – Most of the running belts available in the market are extremely affordable. Amazon offers a huge selection of high quality running belts with prices that start from $30. 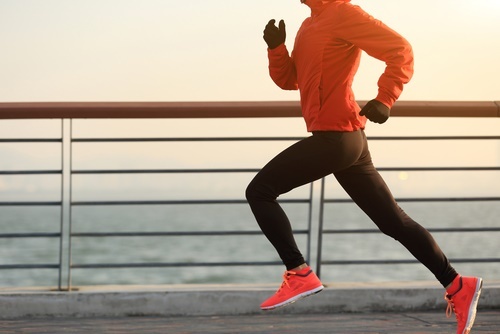 It is important to remember though that when you are purchasing a running gear, make sure you are buying one that is made out of high-quality material. You can use it for a lot of purposes so make sure you are purchasing one that can endure your activities. The Results Are Gratifying – A running belt can make your experience a lot more convenient and enjoyable. This is because of the increased comfort it gives plus the increase of your focus and performance. Once you remove all the distractions in your running routine, you will not realize how much difference it will make. 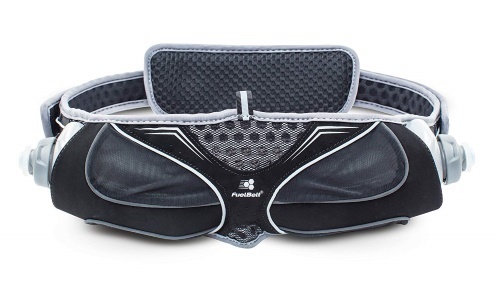 We have rounded up the top 5 running belt that you can choose from. You will surely find the one that will carry all of the things that you need in the following. This running belt by Nathan Sports is an excellent choice if you find yourself being one of those who usually runs in hot weather climates. 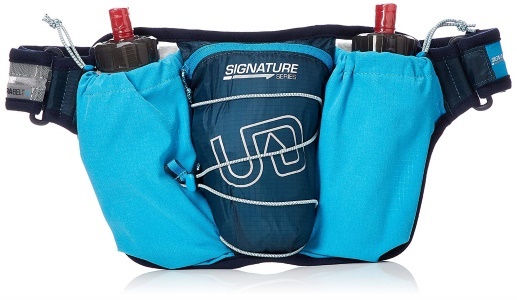 Nathan Sports Insulated Trail Mix Plus running belt comes with 10-ounce insulated Fire and Ice flasks that can keep water cold for a longer time. The flasks are placed in their trademark Speed Fit holsters for easy access. The water flask also does not freeze when exposed to cold weather conditions. In addition to that, the belt has pockets with zippers and has a secured pouched for your key. It also has a separate pocket for foods and snacks. The belt itself is of soft monofilament material that allows multidirectional stretching. This material is the reason why the running bag has a more ergonomic fit and does not bounce as you run. 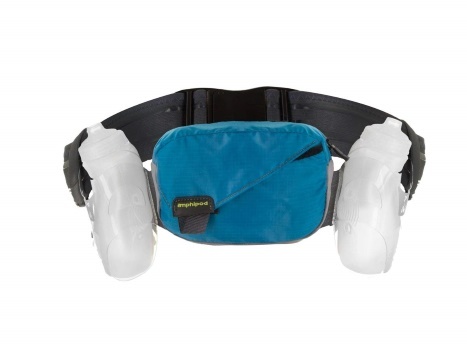 The running belt of Amphipod is equipped with two 10.5 ounces of water bottles with Jet squeeze top and a large pouch. Moreover, you can customize the belt, which means you can add more accessories to the belt to serve more of your needs. The pouch with a front zipper is available in different colors and is large enough to carry items such as iPhone. It also has a space to keep the keys or other items that you want to separate from the larger pouch. Furthermore, the jet squeeze tops of the water bottle make it easier for you to drink water. You can also drink water directly from the nozzle without sloshing or spill it as you run. The belt has a design that will fit your hips perfectly preventing it from bouncing. Additionally, this feature makes it more comfortable for you as you run. This Ultra Belt 4.0 by Ultimate Direction is one of the most comfortable fitting belts that adapts to different body types. This is because of the MonoRip mesh back panel which contours itself to the body. Due to this feature, it is very comfortable and fits without the trouble of bouncing or slipping. 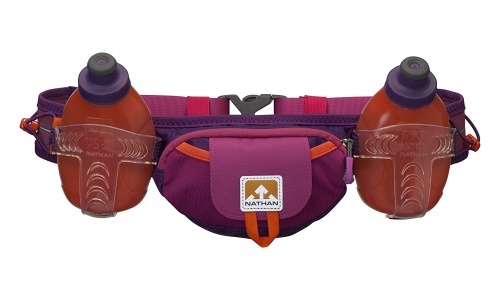 The belt has two water bottle holsters that can hold two 500mL body bottle. This can provide a full liter of water even for a longer run. Furthermore, the body bottles are soft flasks that can mold to your body as you run, resulting to a more comfortable fit. The body bottle also collapses its size as the water gets empty makes it less bulky for you as you run. This Fuel Belt is one of the first running belts in our list that offers a men and women version. Each belt fits specific physical needs depending on the gender. The belt can carry two water bottles that molds to your body to eliminate the bulk. In addition, two bottles that come with it are BPA free and dishwasher safe. For better airflow and comfort, the lightweight belt is from Helium Hex material. Moreover, you will have a running belt with a snug fit that eliminates the bouncing and slipping. 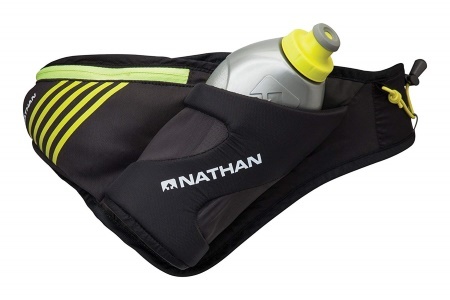 This waist pack by Nathan sports is a running belt that unlike others, only features one bigger bottle. The 18-ounce water bottle fits perfectly in an angled holster, that allows one-handed access to the water. Moreover, the water bottle is also insulated. This keeps the water cold for a longer time and can very helpful. This is especially true if you are running in hot climates or are taking a long endurance run. To keep your essentials safe and secure, it has a zipper pocket that expands as you run. Also, the side panels also extend to fit the contours of your body keeping it slip free. In the end, there more people that are running for training or endurance related events. The more you run, the more you will realize the need of having the right gear. Having good gear will make the process easier. A running belt will help make running more convenient and enjoyable. Furthermore, it can address the different concerns that you have. For example, it helps to hydrate you and also fulfills the necessities without distracting you.